The Life of Bon: The little angels are at it again. I swear, these seventeen year old darlings write my blog posts for me. School has been in session for a mere four days and already I am stockpiling the sweet nectar that leaves these teenagers' mouths for when I'm bone dry in the desert thirsting for a post idea. Was that sentence a little hard for you to follow? Yah. Me too. Two students who sit next to each other in third period. These young bucks come in all shapes and sizes nowadays, I tell you what! When asked to write down what their favorite things were to do, one student answered, "I like 1. Cars 2. Girls 3. Being a Hoodlum." What exactly constitutes for being a hoodlum? And can your English teacher be a hoodlum too? "The best thing that happened to me this summer was I got my first kiss from a girl... who is not my relative." how many cousins has this kid made out with? "This summer I got in a fight with a kid. His name was Ceasar. He punched me in the face and fractured my nose. It was actually a good thing because my nose was born fractured (born fractured?!?) and my whole life it would just start randomly bleeding all the time. Ever since Ceasar punched it back into place I haven't had one nose bleed! I lost the fight but it was actually a good thing because his nose punch was a lot cheaper than surgery." Amen to that! A nose punch for everyone! I don't want to be be premature, but I do believe it's going to be a good year. Thank goodness for Cesar going around punching noses back into place! I'm probably only three or so years older than these kids, but it's crazy to read these and realize the light years of development that happen between graduation and entering your twenties. Thanks so much for following my blog eatprayloverun! I just found yours and am following it too, and already it has made me laugh, which is awesome! Good luck with your teaching and I look forward to more classroom stories! bahahahahaha. 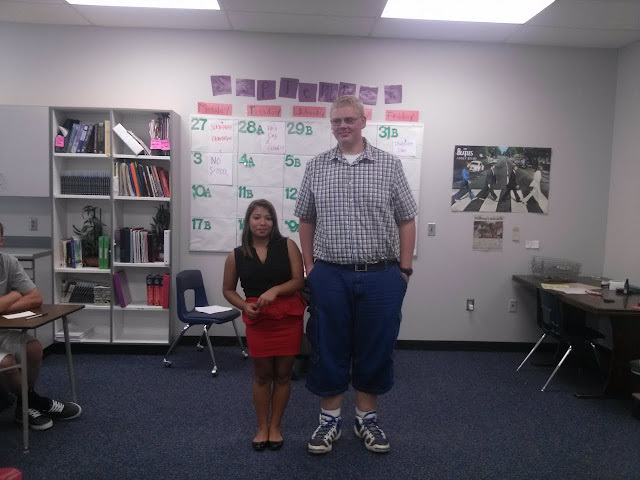 Either that guy is a giant or the girl is really short...maybe both? Definitely sounds like you're going to have a fun year! Oh my lanta! The youth of today are incredible! Can I come be a hoodlum too? Compared to lesson planning, hoodlumming sounds terrific! There are tears rolling down my cheeks from laughing at that last story! I guess getting in a fight is cheaper than surgery! Haha! Love it. Love them. Love you. oh my goodness, this is the BEST post out of the entire 538 that were in my reader from my vacation....you kill me dead and i love every minute of it. thank you for being awesome. OH MY...That is just too funny!! I wonder if a nose punch would help allergies too?!?! Good luck this year...it sounds like you have a feisty bunch of kids!! Bahahaha...I guess we all need a good nose fracture from time time. I'm excited for this school year for you - mostly because I could use some more amusement in my life! Hahaha omg, kids really do say that darnedest things! oh my word. laughing hysterically at this post. i teach first graders so the comments are not as complex. although, hearing first graders discuss Lady Gaga can be highly entertaining. Oh my gosh, kids do say the darndest things! This is hilarious! I am dying laughing! This post is just hilarious! I can't imagine seeing and hearing the things those kids say everyday. Very entertaining. Good luck with the school year! haha that is so funny! I don't think I would have been able to keep a straight face when the kid said he got kissed by a non-relative. Your students seem hilarious! I love that you teach high school. My husband is also a high school teacher. He is an autism specialist. His students really are amazing. oh my gosh!!! I know what you mean! I work in the school system, my sister and hubby are teachers. She works with 4th and he works with 9th, they always talk about kids who they think they are "hood"...I betcha they wouldn't even survive two minutes in the real hood!!! So since that is the case...I will say you are iz hood teach! I just found your blog and am a new follower, whoop! I'd love if you could check out my blog too! Sound like awesome kids. Good for that one kid who bravely shared that he got his first kiss! Hahahah this is amazing. for realz. wow that last one is a real gem. these kids are hilarious -- high school is such a ... special time. kudos to you for walking into that battleground every day. ha! oh my gosh - i just died laughing and had to (1) show my husband that picture and (2) read those answers out loud. since you're an english teacher please don't judge me and my blog posts!! eeeeeekkkkkk! !